INDIANAPOLIS, Indiana – Herff Jones, an achievement division of Varsity Brands and the leading provider of graduation and educational products and services, is pleased to announce it signed a contract with the University of Georgia to produce its new SEC Championship ring, which it earned by defeating Auburn in the final game on Dec. 2, 2017. 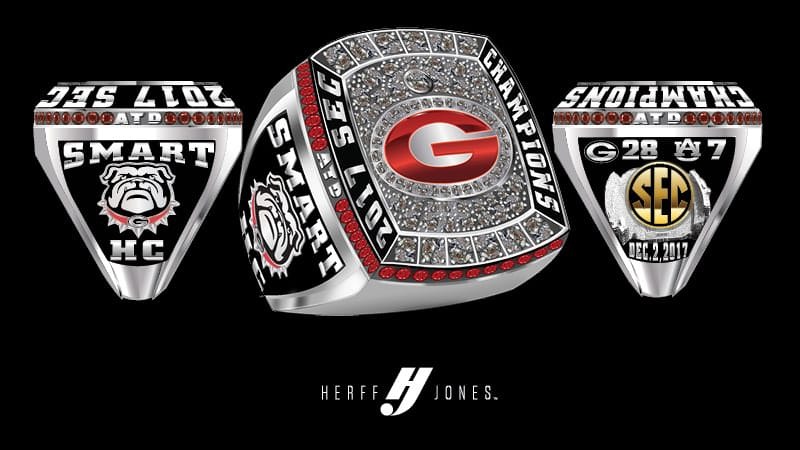 With input from UGA coaches and players, Herff Jones created the official design and will manufacture and later present the ring to the team per the terms of the agreement. The top of each champ ring features a red UGA logo with a CZ encrusted inlay. One side of each ring showcases player names and an image of the Bulldog mascot. The other side of the ring presents a gold SEC logo and the date of the 2017 championship game. Herff Jones representatives presented the final ring design to the Bulldog team at a special event on Jan. 11. Indianapolis-based Herff Jones is the leading provider of graduation and educational products and services designed to inspire achievement and create memorable experiences for young people. A division of Varsity Brands, Herff Jones’ products include class rings and jewelry, caps and gowns, yearbooks, diplomas and announcements as well as motivation and recognition programs. Focused on building long-term relationships through a nationwide network of over 2,000 employees and sales partners, the professionals at Herff Jones have been helping elevate the student experience and celebrate academic milestones for more than 98 years. For more information about Herff Jones or Varsity Brands, please visit www.herffjones.com or www.varsitybrands.com. With a mission to inspire achievement and create memorable experiences for young people, Varsity Brands elevates the student experience, promotes participation and celebrates achievement through three unique but interrelated businesses: Herff Jones, A Varsity Achievement Brand; BSN SPORTS, a Varsity Sport Brand; and Varsity Spirit. Together, these assets promote personal, school and community pride through their customizable products and programs to elementary and middle schools, high schools, and colleges and universities, as well as church organizations, professional and collegiate sports teams and corporations. Through its 8,600 dedicated employees and independent representatives, Varsity Brands reaches its individual and institutional customers each year via catalog, telesales, e-commerce sites and direct sales channels.